Spend a beautiful morning surrounded by nature. Explore the breathtaking beaches around Acapulco on horseback and have the opportunity of adopting and releasing a baby turtle into the Pacific Ocean. Experience a unique journey on horseback through unspoiled little visited places, along remote beaches and taking in breathtaking views. This tour, which has options for both beginners and more experienced riders, uses rescued and rehabilitated horses from homes where they were not well cared for. 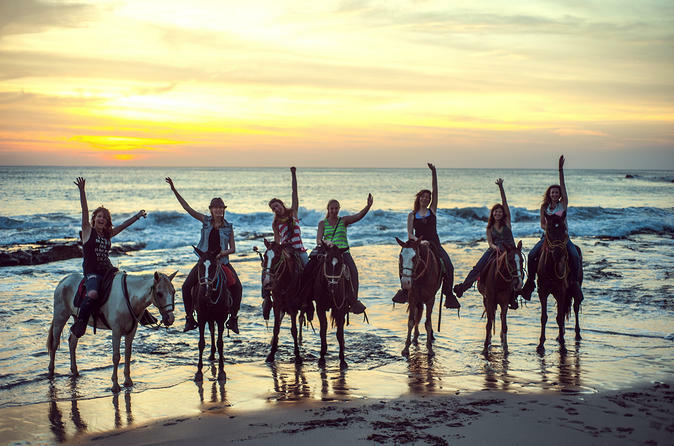 After pickup from your hotel or port, board your vehicle for the 45-minute drive to your horseback riding adventure outside of Acapulco and a baby turtle release session. Once on board, visit the Turtle Camp where you'll learn all about their mission in the camp which strives for the conservation and well-being of sea turtles. You will then help release turtles into the ocean and then continue the tour to go horseback riding. The ride is suitable to every level and you will receive a safety briefing and basic instructions. Then, set out on the trail through the beach surroundings, passing coconut palms and other native plant and animal life along your journey. You'll ride for about 1.0 hours along the beach before returning to the base. You’ll have plenty of photo opportunities so keep your eyes peeled for the perfect shot of Pacific Ocean. Your tour ends with drop‐off at your hotel or cruise ship.